Finishing a basement is a popular way to increase living space, but basements are prone to moisture problems. When I was growing up, I remember going downstairs with towels to sop up water from the carpet whenever we had a heavy rainstorm. 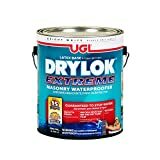 In my first house, I discovered a problem with moisture that would lead to me gutting the entire basement. Here are some basement waterproofing methods to deal with moisture and water problems and help you stay dry. Do you have a water or moisture problem? A sure sign that water is coming in the basement. Some water problems are more obvious than others. For example, if your basement floor is wet after a rainfall, like the picture on the left, then you know water is coming in from outside. Some moisture problems are not as obvious. Evaporation may take place before the problem is evident and you are never the wiser. However, you may find a white chalky residue on the wall. This is efflorescence, and it is the mineral deposits left behind by water that has infiltrated the foundation has evaporated. Efflorescence: The mineral deposits left behind after the evaporation of water. If the problem is buried behind a wall and vapor barrier, or under a carpet, evaporation cannot take place and the water accumulates resulting in property damage and mold growth. Not only is this a comfort issue, but the mold can lead to health complications as well. And then there are financial implications. Nobody wants to spend thousands on a basement renovation only to have to rip everything out after a few years to address the water and moisture issues that should have been addressed from the beginning. Take a piece of vapor barrier or other plastic or tin foil and tape it in place on the floor or on the foundation wall. Be sure to seal all edges with tape so it is air tight. If moisture collects on the underside of the plastic, you have infiltration. Moisture collecting on the outside of the plastic is condensation caused by moist air coming in contact with a cold surface. This can be controlled by adjusting the humidity using a dehumidifier. It will also be eliminated by proper installation of insulation and vapor barrier. The object is to prevent warm moist air from coming in contact with cold surfaces. There are a number of ways to address foundation water issues, with the best solution being an exterior membrane system to stop the water outside. Interior weeping and sump pump systems address and control water after it comes into the house. Do-it-yourselfers looking for an affordable solution can choose a paint-on waterproofing product although this option works best in combination with one of the other two. By far, the best way to prevent water problems is to prevent water from coming into the house in the first place. 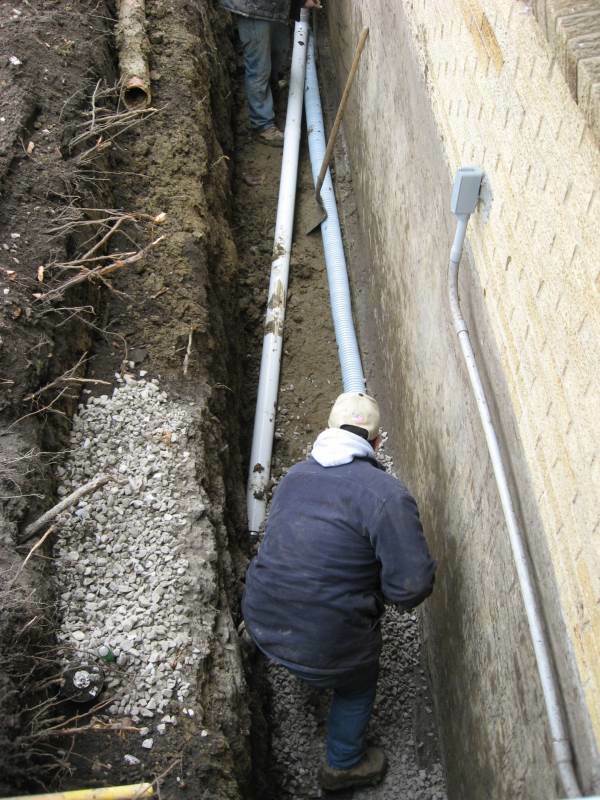 As a retrofit, it is necessary to dig around the house down to the footings. Drainage tile is repaired or replaced. Any foundation cracks are repaired and the foundation is coated with tar or similar product. Then the membrane is fastened to the foundation and prevents water from coming in contact with the block. The water is controlled by a weeping tile system that directs it to either a storm sewer, or to a French drain that dispels it away from the house or directs it to a collection pond or low point on the property. The photos below are of the installation of a membrane system on my late father’s house prior to putting it on the market. Repairs are made to the weeping tile. The membrane is fastened to the foundation. Block foundations usually have weeping holes drilled in the lowest blocks below the slab to prevent the build-up of hydrostatic pressure. Any water coming in through the weeping holes is controlled by a weeping tile system. The weeping tile either carries the water to a sump pump or directly to a storm drain. This requires that the slab be broken up around the perimeter of the basement. Image from Xypex.com. Used without permission. The easiest DIY solution is to use a product such as Xypex or Drylok to seal the foundation walls. Be sure to prepare the surfaces according to the instructions. I have used both of these products and highly recommend Xypex, which works through a crystallization process. The surface has to be saturated prior to applying the product, and once the product is applied it must be kept damp for a period of a couple of days. This allows for the formulation of crystal which grow into the nooks and crannies, becoming a permanent part of the structure. The drawback is that the product has to be kept damp. You could probably use a spray bottle filled with water to keep the mess down. I didn’t need to worry about making a mess, so I used my garden hose with the nozzle set to a light mist, and as a result, I saved a lot of time (and repetitive stress on my trigger finger), though I ended up with quite a bit of water on the floor. Drylok is not as messy and is applied like a thick paint making it more DIY-friendly. It is more of a surface coating, but does contain Portland cement which bonds it to the wall surface. It is also the more affordable option. Even if you don’t have moisture coming up through the slab, you should still use a moisture barrier and subfloor system. Products such as DriCore (right) and ThermalDry feature a dimpled membrane that channels any condensation or seepage to your floor drain while raising your sub-floor off of the concrete. DriCore comes with waferboard attached to the membrane. The added benefit of these products is that the air space they create acts as insulation: the floor is raised off of the cold concrete which helps keep your feet warm. Condensation occurs when warm moist air comes in contact with a cooler surface, such as the foundation wall or slab floor. Think of the water droplets that form on a cold can of pop (or, better yet, a bottle of beer). A dehumidifier will help reduce the humidity in the air and proper insulation and vapor barrier will prevent that warm air from coming in contact with the wall. As well, you will want to insulate your cold water pipes. On a particularly humid day, we actually had wet lines across our basement floor directly under “sweating” pipes. Basement leaks and moisture problems can be minimized by taking a few simple steps to keep water away from the foundation. Make sure your eaves troughs and gutters are in good order. Ensure that downspouts direct water away from the house. Landscaping should be sloped away from the house as well to prevent pooling around the foundation. These simple steps can go a long way to solving some leaky foundations and could help you avoid spending money on more expensive solutions. A search of the Internet turned up numerous waterproofing systems and products. Which ones are right for you will depend on your budget and the extent of the moisture problems you have. I have only briefly touched on the products and solutions of which I have some familiarity.